So you’ve begun to develop an interest in Archery? Excellent! Archery is a fun and addictive form of exercise with a wide range of health and social benefits, and we hope you’ll come to love the sport as much as we do. One of the best things about Archery is that regardless of strength, smarts, fitness, or weight; anybody can become a great archer with practice. Did you know that Archery is one of the only Olympic sports where the same athlete has competed in both the Olympics and Paralympics; in the same year! Here at TheModernArcher we aim to provide a wealth of information about archery for beginners, as well as those of you hoping to take your skills and equipment to the next level. If you’re just getting started with archery, then the logical place to start is by getting yourself a bow! Depending on how your interest in Archery was sparked (e.g. friends, movies, history), you may already have an idea of what kind of bow you would like to use. 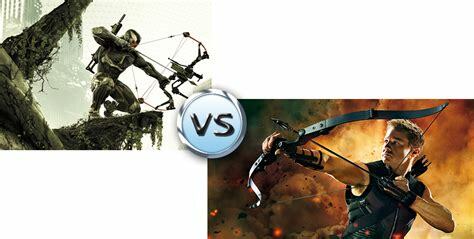 If not, then the first decision will be choosing between Compound Bows and Recurve Bows. We’ve written comprehensive guides on the features and technical advantages of compound bows and recurve bows, but as a social sport or a hobby, either choice will find you many like-minded archers at any local club. Deciding between recurve bows and compound bows really depends on what you are looking to achieve by getting into archery. If you are interested in traditional archery, emulating most archers seen in TV and movies, or even someday standing on the gold medal podium at the Olympics, then a recurve bow is likely to be your preferred choice. Whilst recurve bows are generally less powerful than compound bows, their greater reliance on human skill to pull off an amazing shot means that they are currently the only form of bow allowed in the Olympics. They are quicker and easier to fire and as an added bonus, their lower entry-level cost and greater ease of maintenance and transport also makes recurve bows one of the safest and easiest choices to sample archery for beginners. On the other hand, a compound bow is designed to improve the accuracy and power of an archers shot by mechanically assisting the firer to build kinetic energy, hold it, and then release it in a stable and controlled manner. Compared with recurve bow, a compound bow allows the archer to fully draw their bow and then hold it at maximum power, with much less exertion (usually about 20% of the maximum draw weight). This ability to generate and hold energy means that on average, a compound bow will be more powerful than a recurve bow of the same draw weight, as the maximum strength requirement is only needed at the beginning of your draw and for a relatively short time, rather than right at the end of your draw (in the case of a recurve bow). After drawing the bow, the archer is free to take their time aiming the shot and adjusting for wind and distance, without straining their arm and back muscles as much. Because a compound bow will generally store and release more kinetic energy, arrows will fly faster, further, and be less affected by gravity over short-medium distances. This make compound bows the best choice for bow hunters. Coupled with stabilizers, scopes and a myriad of other accessories (which can also be used on some recurve bows), a compound bow can be extremely accurate and powerful over long distances in the hands of a skilled archer. If you are interested in the technical details, our guides go through the key features of both compound bows and recurve bows to give you an understanding of just how advanced modern bows can be. It is however important to remember that while a compound bow allows you to hold an arrow at full draw with less exertion; you still need to be able to draw the bow in the first place. Most people would actually be able to hold a 100 pound compound bow at full draw, but far fewer people would actually be able to draw it to that point. Whilst great pieces of equipment, compound bows aren’t magic and still have to follow the laws of physics, so you only get out what you can put in. Either type of bow could be considered ‘the best’ depending of what you like or want to achieve in your sport/hobby, but we simply prefer to think of them as two different, but related sports. It’s a bit like the difference between a canoe and a sailboat. Both are great fun to use and some people will prefer one over the other, but you can’t really compare them. However there is nothing wrong with having more than one bow and you will find plenty of local competitions and tournaments for both! If you take a look for a bow on a shop such as Amazon, you’ll literally find hundreds of different models ranging from $100 to well over $1000! This can be overwhelming for someone who’s just getting started, so we’ve narrowed down the choices to find some of the best beginner bows on the market. Recurve Bows Name Price Check Our Review Draw Weight Bow Weight Fast Flight Compatible? Take Down? Hunting Suitable? Compound Bows Name Price Check Our Review Draw Weight Draw Length Bow Weight Let-off Hunting Suitable? The fact that we’ve classed these bows as ‘beginner suitable’ doesn’t mean that they are inferior in quality. They are well crafted and will shoot an arrow just as well as any of the fancier models. They have however been on the market for a few years, so they don’t have the price tag that the shiny new models attract. Also, their broad popularity means that the manufacturers sell a lot more of them at a smaller profit margin, than compared to their flagship models. Each of these bows can be purchased in a package, or as a standalone bow. The standalone models are still ready to shoot straight out of the box, but don’t come pre-loaded with useful additions such as a sight, stabilizer, or a quiver. Most modern bow accessories use a standardized attachment system, so if you want to spend a bit more time surfing on Amazon to select your own custom accessories, then certainly go with the standalone bow. We should point out that most bow packages (with the exception of the Genesis Bow and the Martin Panther) do not come with arrows included. This is because the choice of arrow can be a very involved process, and at the very least, you don’t want everyone to shoot the exact same arrows as you’d never remember which ones were yours! For a great set of affordable carbon fiber arrows which are safe for the heavier draw weights, we recommend these or these best-sellers. Once the choice is made and your friendly Amazon driver shows up with your preferred bow, you’ll want to string it up and adjust the bow settings to perfectly suit the length and strength of your arms (if not already done during the ordering process). The bow manufacturer will have included instructions on how to make simple adjustments to the draw weight and length, and our comprehensive guides will help you to easily determine what the best bow settings will be for you. Getting a brand new bow in the mail is very exciting; but do NOT draw and release your bow without an arrow! This can prematurely damage your bow as the force that would be normally be applied to push an arrow forwards, instead gets directed inwards against the arms of the bow. This is known as dry-firing your bow, and will pretty much void your warranty. Modern bows are designed to be accurate and powerful, but also light. Even with the most advanced composite materials, this power/weight tradeoff means that bow manufacturers mainly have to focus on strengthening the areas of the frame which get stressed during the firing of an arrow. When an arrow isn’t present, the stored energy is released against different areas of the bow which are not designed to withstand such punishment. When you’re finally ready to start, you’ll need somewhere safe to practice your shots. Depending on your bow settings, an arrow shot can exceed 300 yards (275 meters) and as the range increases, the accuracy can start to vary wildly. Whilst high level competition archers may feel comfortable with lots of spectators close to their firing arc, we strongly suggest that you don’t shoot any arrows if there are any people, animals or obstacles within a 90° cone of the direction you’re aiming. Unless you’ve got a large, clear, fenced off property with excellent line of sight (or a sturdy enclosed indoor area longer than 25 yards), we’d recommend that you don’t practice in your backyard. Even with a solid brick wall at the edge of your yard, an accidental twitch when firing could send your arrow up and over that wall, with unknown consequences on the other side. Remember that bows and arrows have been used in warfare for thousands of years, and the passage of time hasn’t made them any less dangerous! Fortunately, archery is a very popular sport in the US and every state has multiple clubs with their own practice areas. These range in size from indoor clubs that focus on mid-range target archery, to clubs with huge landholdings which are great for field archery and can cater for every type of archer and shooting style. Many clubs will even hold special events for traditional archery, complete with authentic costumes and traditional longbows. 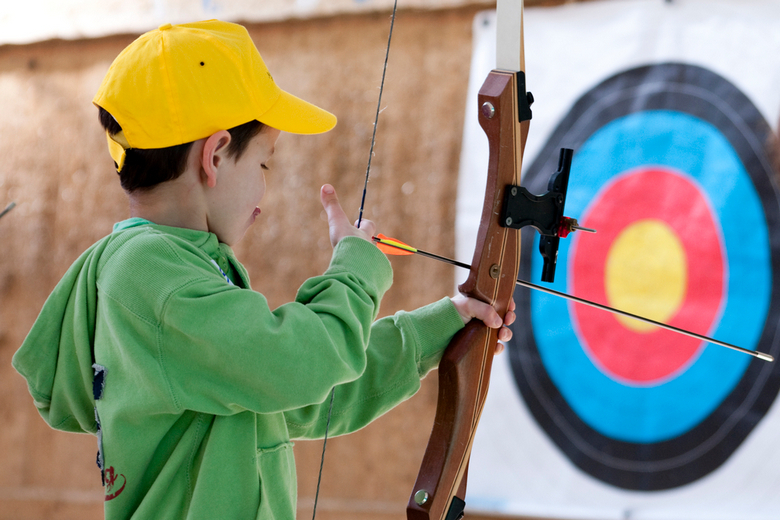 When it comes to visiting archery clubs, you’ll probably be pleasantly surprised by the cost as most are operated by members who are archery enthusiasts, and not run for profit. We’ve found that most clubs are very welcoming to new members, and if you call them up beforehand, many are willing to give you a free basic lesson with the clubs own equipment. This can help you decide if you’d like to take up archery, and what kind of bow style you prefer. The starter sets of archery gear shown above will be perfect for most people, but if you have a few more dollars to spend and want to get the most out of your sport (or are looking to make other archer jealous! ), then check out our other comprehensive bow and arrow reviews, along with guides to picking the best arrows and bow accessories. Finally, head over to our Compound Bow Guide or Recurve Bow Guide for our step by step tutorials on how to perfect your shots, including how to determine your dominant eye, the different methods of drawing your bow, aiming techniques, and what is the correct stance for shooting an arrow.